The United States is a nation of immigrants, with the exception of the Native Americans that continue to be tread on. It was immigrants who built the land into one of the strongest countries in human history, and it is immigrants who continue to invigorate, diversify, and enrich American lives and communities. It is a proud national heritage to welcome in those seeking better opportunities. American classical music is no different. Copland and Gershwin were two of the nation’s greatest composers, and both were the sons of immigrants. And many of Europe’s finest fled to the United States to escape artistic, cultural, or religious persecution and found a new home and citizenship. Think of all the great music that might never have been composed had these artists been refused asylum! And think of the contributions and advancements the world misses out on when those seeking freedom are turned away. 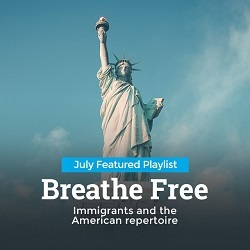 For this month’s playlist we are celebrating composers who found new opportunity in the United States, and we are sharing music that might never have been widely heard or even composed at all if America had not welcomed in those yearning to Breathe Free. 1. John Stafford Smith, arr. Igor Stravinsky – The Star Spangled Banner – At the outbreak of World War II, Igor Stravinsky emigrated to the United States, ultimately earning citizenship in 1945. He honored his new country with an arrangement of its national anthem, though not without some controversy (and a threat of a fine from the Boston police) over some less-traditional chord choices. 2. Irving Berlin – God Bless America – Yes, the man who wrote “God Bless America” and became one of America’s greatest songwriters was a Russian immigrant. His family was Jewish, and when he was a child they were forced to emigrate to New York City to escape the pogroms of Tsar Nicholas II. They lived in abject poverty, and Berlin taught himself to write songs and play the piano because it was the only work he could find. 3. Mario Castelnuovo-Tedesco – Concerto sereno: III. Fiesta: Allegretto vivace – Castelnuovo-Tedesco emigrated from Italy to escape the fascist government and its restrictions on the arts, with the great Arturo Toscanini offering to be his sponsor. He found a successful career as a film composer in Hollywood, though he continued to compose more formal music, including this guitar concerto. 4. Lukas Foss – American Landscapes: III. Allegro – German-born Lukas Foss arrived in the United States with his family when he was a teenager, where the young prodigy studied at the Curtis Institute of Music in Philadelphia. While there he became lifelong friends with Leonard Bernstein, and later in life they would conduct premieres for each other. 5. Leo Ornstein – Piano Sonata No. 4: Semplice – The Ornstein family emigrated to the United States to escape the Jewish pogroms in Ukraine when Leo was eleven years old. By that time he was already a recognized talent, having studied with Alexander Glazunov and earned his way by coaching opera singers. Once in the U.S. he developed his own style, later becoming recognized as the first important composer to make extensive use of tone clusters. 6. Béla Bartók – Concerto for Orchestra: V. Finale: Presto – Bartók was a strong and vocal supporter of Hungarian culture, and it was with great reluctance that he left his homeland in 1940 to escape Nazism. He became a U.S. citizen in 1945, but he struggled to compose during these last years of his life. However, a late commission resulted in Concerto for Orchestra, a final success premiered the year before his death from leukemia. 7. Miklós Rózsa – Sinfonia Concertante: III. Allegro con brio – Like Castelnuovo-Tedesco, Budapest-born Miklós Rózsa found a successful career as a composer for Hollywood without leaving behind more formal musical pursuits. He composed Sinfonia Concertante for violinist Jascha Heifetz and cellist Gregor Piatigorsky in 1958. 8. Tania León – Scourge of Hyacinths: Oh Yemanja (Mother’s Prayer) – Tania León left her homeland of Cuba in 1967 to study at New York University. She has since enjoyed a successful career in the U.S. as a composer, conductor, and champion of Latin American music. Her music has been performed all over the world, though it was not performed in Cuba until 2010. 9. Vally Weigl – Songs of Love and Leaving: III. Valley Song – Weigl moved to the United States from Austria with her husband Karl, also a composer, shortly before the outbreak of World War II. A grant from the National Endowment for the Arts funded the recording selected here. Not only was she a composer, but she enjoyed a career in music therapy, which included a position as chief medical therapist at New York Medical College. 10. Kurt Weill – Lost in the Stars, Act I: Lost in the Stars – Already a prominent composer, Weill was forced to flee Nazi Germany because of his Jewish heritage and populist views. He made it to the U.S. in 1935, at which point he concentrated primarily on composing in the popular and stage idioms of the day. His work from this time is considered influential in the development of the modern American musical. 11. Ignatz Waghalter – New World Suite: VII. City Dance – Besides his music, Jewish composer Ignatz Waghalter is remembered for his efforts in promoting racial equality. Forced to flee Germany during World War II, he took up residence in New York City and established a classical orchestra made up of African-American musicians, though the ensemble had to fold due to financial problems brought about by the Depression and political hostility. 12. Victor Herbert – Babes in Toyland: March of the Toys – Born in Ireland and educated in Germany, Victor Herbert moved in 1886 with his new bride Therese Förster to the U.S., where both were to be employed by the Metropolitan Opera in New York City. He is remembered today as a popular composer for the stage and a founder of ASCAP, though he also composed “serious” music and was a prominent cellist. 13. Franz Waxman – Taras Bulba: Ride of Cossacks – In 1934, Jewish composer Franz Waxman was severely beaten by Nazi sympathizers, prompting his emigration. In the U.S. he built a successful career as a film composer, scoring films such as Sunset Boulevard, A Place in the Sun, Suspicion, The Philadelphia Story, Rebecca, The Spirit of St. Louis, and Taras Bulba. He also scored a number of Oscar nominations, winning two. 14. Erich Korngold – The Sea Hawk: Original Theatrical Trailer – Erich Korngold was the first composer of international stature to sign on with a Hollywood studio, a position that had the added benefit of keeping him out of the Nazi eye. His original scores helped to elevate film music to an art form all its own; in fact, along with Max Steiner and Alfred Newman, he can be considered one of the founders of film music as we know it. 15. Max Steiner – Casablanca – Like Korngold, Steiner’s skill as a film composer was his ticket out of Central Europe in the years leading up to World War II. But unlike Korngold, film music makes up most of his oeuvre; he composed over 300 scores and picked up twenty-four Oscar nominations, winning three. His best-known films include Casablanca, Gone With the Wind, King Kong, and Little Women. 16. Bright Sheng – China Dreams: The Three Gorges of the Long River – Bright Sheng moved from his homeland to the United States in 1982, and he composed the work China Dreams in the early nineties, when he was feeling homesick after not seeing China in more than a decade. The long river in the title of this movement refers to the Yangtze River. 17. Chen Yi – At the Kansas City Chinese New Year Concert: III. Blue Dragon Sword Dance – Chen Yi grew up in a musical family in China, which was her introduction to Western classical music. During the Cultural Revolution in the late 1960s, she was sent to work in the countryside, and while there she learned to appreciate the folk music of her homeland. She has lived in the U.S. for many years, including in New York City and Kansas City. 18. Edgard Varèse – Tuning Up – Varèse’s total surviving compositional output consists of only about three hours of what he called “organized sound”, but it has proved immensely influential in its use of timbre and rhythm. Of French and Italian heritage, he moved to the United States at the onset of World War I after being rejected from the French military. 19. Ernő Dohnányi – Symphony No. 2: III. Burla: Allegro – Unlike many of the composers in this playlist, Dohnányi remained in Europe during World War II; in fact, he was instrumental in assisting a number of Jewish musicians escape Hitler’s reach, and his son was friends with Dietrich Bonhoeffer and was an active member of the anti-Nazi resistance. It was after the war that Dohnányi joined the faculty of Florida State University, and he became an American citizen in 1955. 20. Arnold Schoenberg – Violin Concerto: III. Finale: Allegro – Schoenberg was vacationing in France shortly after Hitler’s rise to power, and he was warned then that returning to Germany could be dangerous. He immediately formally reclaimed his membership in the Jewish faith at a Paris synagogue, and when attempts to find asylum in Britain failed, he moved to the United States, where he became a citizen in 1941.